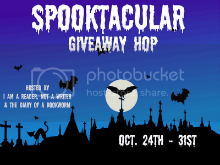 As part of the Spooktacular Giveaway Hop hosted by I Am A Reader, Not A Writer and The Diary of a Bookworm I am giving away a hardbacked copy of Liesl and Po by Lauren Oliver. This is the UK version of the book. This is an international competion. To enter, just fill out the form below. For an extra entry, become a follower of this blog. If you are already a follower and you come up in the followers section of the blog, you will automatically gain a second entry. The competition closes on the 31st October. Please fill out the form below for a chance to win. For more chances to win brilliant prizes in this huge giveaway, click here to visit the rest of the Spooktacular Giveaway. This looks like a great book! I love thew look of your blog these days--very ethreal. Thank you so much! this book has been on my to read list for so long! Don't forget to have your Jack-o-Lanterns out to keep the spirits away! !